The VSA Race Series has been a popular event since it was started in 2004. It has been modified nearly every year, and this year is no exception. The Race has always been appreciated as a day of fun flying, an opportunity to have social events, a day for learning experiences, an opportunity to compete, and a day to experience the many aspects of the sport of soaring. 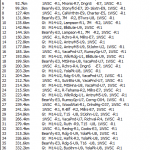 The data base of turn points used in the race series is published by John Leibacher on the Worldwide Soaring turn point Exchange, located at http://soaringweb.org/TP/NA.html#CALIF The data file for the 2013 VSA Race Series is called “wsc12a″. The start gate will be a cylinder and details will be specified by the CD. Pilots must fly within one statute mile (sm) of each turn point. The finish line will be crossing overhead the runway at Williams and all finishes will be from the west to the east. The task distance that is published on the task list will be used to compute the task speed. Points will not be accumulated for a season winner. Here are some examples of tasks that the CD may use. The CD may create other tasks as well, using the current WSC database (“wsc12”).